This is one of a series of problems designed to develop learners' team working skills. Other tasks in the series can be found by going to this article. Learners must complete the task themselves but with support and advice from other members of the team. This problem needs a team of four. A fifth person can act as an observer. You need to arrange the desks and some props so that everyone can see everyone else but no one can see what anyone else is building. One possibility is for the designer to face the other three team members and make the design inside a box whilst team members try to recreate the design behind books or folders used as screens. You will need four sets of counters (or similar) - up to 12 in each set. Choose someone in the group to be the designer. If there are five people choose a person to be the observer. If you try this task more than once, team members should take turns at playing these roles. Give one set of counters to the designer and one set to each of the other team members. 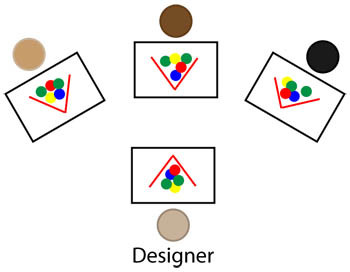 The designer creates a counter design so that it is hidden from the rest of the team but as s/he makes the design, s/he explains what it looks like so that the rest of the team can make a copy of the same design. Team members can ask questions about the design at any time and the designer answers in as helpful a way as possible. When a team member thinks they have a completed design, they ask the designer to check. If it is right they can then aid the designer in answering questions. If they do not have the correct design the task continues. Remember that all help has to be given without sight of the enquirer's design. At any point the task can be brought to an end to discuss the success of the questioning and answering, and how it helped or hindered completion of the task. How well did the designer explain the process of creation? What words did they use that were really helpful? How clear were the questions the team asked? Can you give an example of a good question? How well were the questions answered? Can you give a good example? We have written a version of this task which is suitable for one child and an adult playing together at home. Questioning. Making and proving conjectures. Group worthy. Pedagogy. Practical Activity. Team-building. PrimaryCollaborative. Investigations. Working systematically. Addition & subtraction.